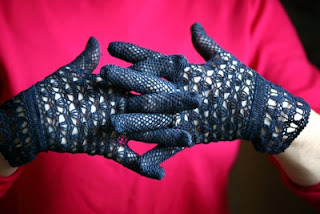 This are vintage navy blue crochet gloves that are a lovely feminine accessory to add to your wardrobe. They are vintage cotton crochet lace gloves are late 1940s, early 1950s. I have washed the gloves by hand and then air dried. Note: See last photo for flaw – a hole in the thumb area which is why I have reduced the price. If you can crochet, or know someone that does, it could be mended. ♦ Sizing – I have a fairly small hand. According to the website mentioned below I would be a medium (7). Sizing is generally determined by measuring the widest part of hand..knuckles with hand slightly flexed…make a fist. This will give a circumference size. Check this website for measuring your hand to find your glove size.